Would you like an injury free running technique before doing all that serious marathon training? How Vital is an Injury Free Running Technique? You'll likely take more than a million steps in your marathon campaign! Surely then, don't you owe it to yourself to have the best running form possible to meet this challenge? After all, you don't want to waste your valuable time getting better at running badly! Good long distance running form doesn't need to be poetry in motion. Unfortunately, far too many runners look more like poultry in motion during their marathon training! Just before we discuss how to improve running form, let's look at why having a proper running technique is so important. 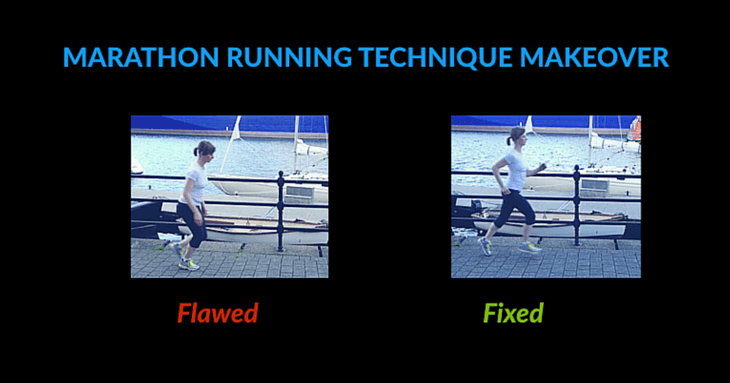 Proper running mechanics - This allows you to run faster for longer! Competitive gain - The majority of your fellow runners will leap straight away into their marathon training schedule! What could be more satisfying than enjoying running faster, with reduced risk of injury? A real boost before your serious marathon training even starts! 1. Don't drop your head: This is bad from both a biomechanical and psychological standpoint. 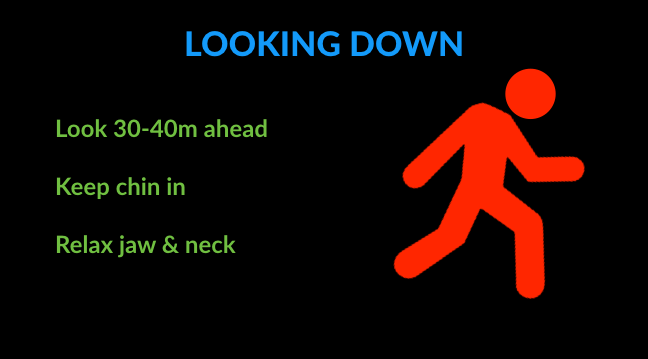 Look 30-40m ahead rather down at the ground, keep your chin in and remember to relax your jaw and neck. 2. Relax your shoulders: Shaking them loose before running helps. Keep them square, rolled back and level but not too tensed up and rigid. Letting them rotate slightly while running will create an efficient natural rhythm. 3. 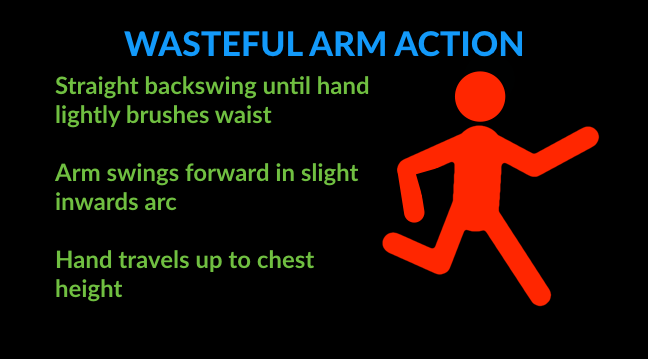 Avoid wasteful arm action: Take smooth, straight backswings far enough back until your hand lightly brushes your waist. Let your arm then swing forwards naturally in a slight inwards arc rather than a forced, robotic action! Your hand should travel up to around chest height. 4. 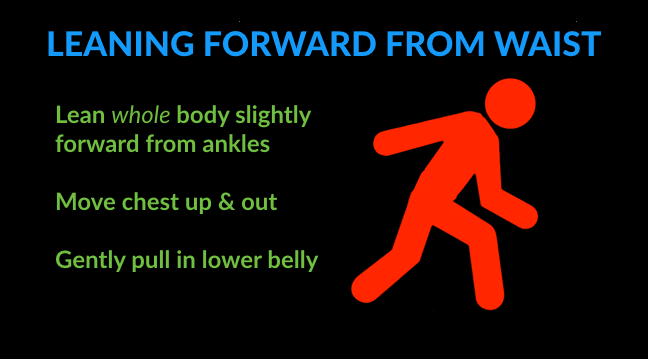 Lean your whole body forward slightly: Leaning forward from the waist rather than from the ankles is a common technique flaw. More subtle improvements are moving your chest up and out and gently pulling in your lower belly slightly. 5. Sort out your hips: Correct hip action is vital for good running form, so 'sitting' on them with your bottom protruding, or lifting your knees up too far won't help the cause! Your action will improve enormously if you can push down and back to lengthen your stride behind your body slightly. 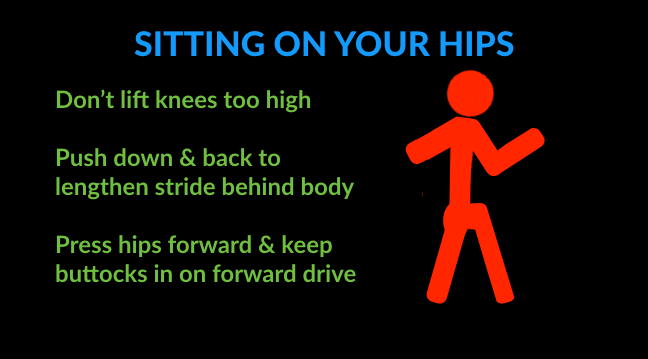 Then make sure those hips are pushed forward with your bottom kept in on the forward drive. 6. 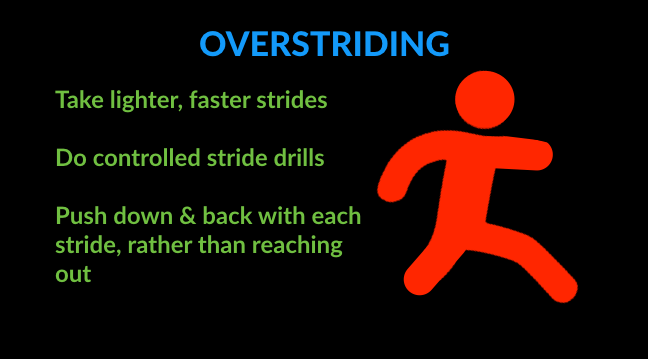 Avoid overstriding: Take lighter faster strides reinforced by controlled drills. 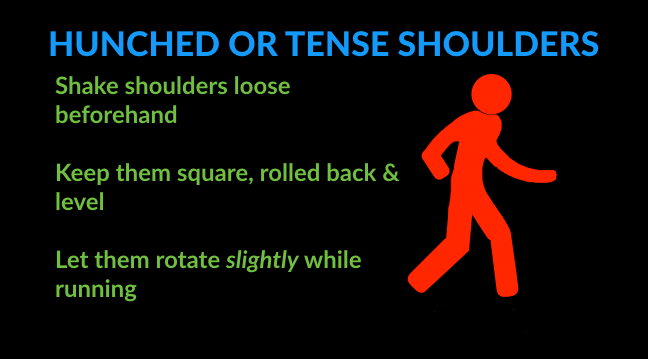 Remember also to push down and back with each stride. If you reach out too far, the impact forces created from the resulting heel strikes are inefficient and damaging to your lower body. 7. Scan your body: Get into the habit of performing mental body scans to seek out unwanted tension, straining and clenching. 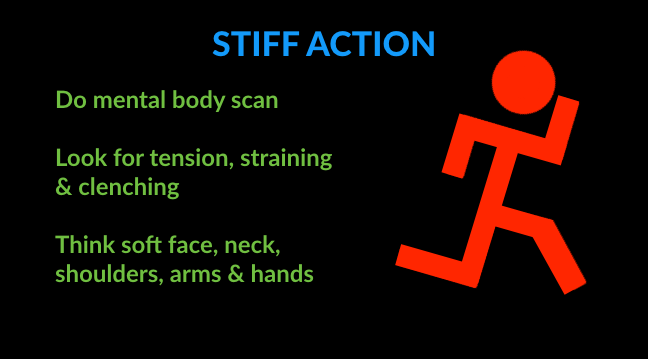 Think soft face, neck, shoulders, arms and hands and many of the aspects of good running action will take care of themselves. A final word of advice... Don't try to correct running form in one session! You'll become overwhelmed and nothing will change. Use these running technique tips to tackle one bad habit at a time. Start with the most obvious flaw and watch your best running technique evolve progressively. ​How do you maintain your good form running? Correct the flaws and incorporate running﻿ form drills into some of your easier workouts to reinforce the good practice you've developed. If you want to take things a stage further, download this One Page Head-to-Toe Marathon Running Technique Checklist and Video Walkthrough! It gives you 26 quick and easy ways to develop and maintain proper technique for running and ultimately improve your long distance running form! 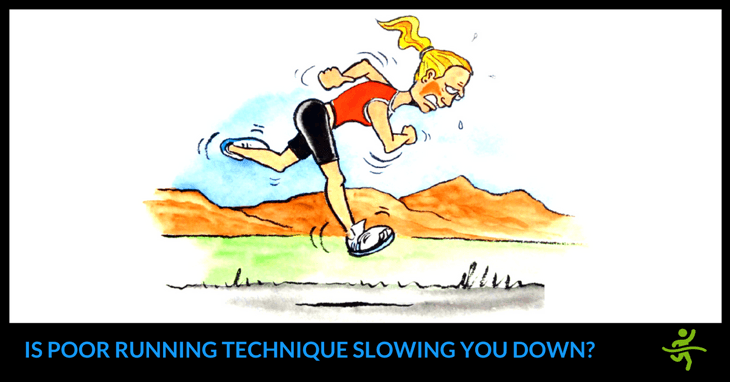 I hope you found this brief guide on improving long distance running form useful. Please leave your comments below. Great post! It is a perfect explanation of running technique. I think those tips will help to be smoother, faster and healthier in no time! Thanks!